CCSP offers numerous avenues for patients to introduce or regain physical activity into their lives, including individual consultations and group classes such as Get Real and Heel, a group exercise series, and Cancer Transitions®, a six-week class that includes exercise, nutrition and stress management. See information below. Across NC-Learn What’s Next After Treatment! Wondering how to move forward after treatment? Learn about Cancer Transitions and other programs. A unique program designed to serve cancer patients in North Carolina. Get REAL & HEEL is not just an exercise program. It integrates individualized prescriptive exercise with recreational therapy to provide a program that strengthens your body and mind. We develop an individualized plan that helps each participant manage cancer treatment-related symptoms and increase chances of survivorship and quality of life. Because of grant support, this program is currently provided to individuals free of charge. Please visit Get REAL & HEEL or contact Carly Bailey at 919-445-4255 or carly_bailey@med.unc.edu. A FREE 2 ½-hour, 4-6 week workshop to help cancer survivors and their caregivers make the transition from active treatment to post-treatment care. Meet other survivors, get your questions answered and learn how to move forward and positively impact your life. Expert panelist including physicians, nutritionists, nurses and fitness experts will discuss topics such as: Get Back to Wellness, Healthy Eating Post-Treatment, Medical Care and Surveillance, Physical Activity, and Emotional Health and Wellbeing. You will learn about exercise tailored to each participant’s abilities, training in relaxation and stress management and tips for nutritious eating. Cancer Transitions has a proven track record as an evidence-based program that provides cancer survivors with the tools they need to take charge of their own health and quality of life. Cancer Transitions is offered regularly at convenient locations in the area, including Meadowmont-UNC Wellness, and the SECU Family House, as well as numerous locations across the state. View the current calendar, or visit the Cancer Transitions page, or call the Patient and Family Resource Center at (984) 974-8100 to learn about current programs. Visit the Integrative Medicine Page for more info on our yoga classes! More research is being done on how the practice of yoga can have positive health effects for people living with cancer, cancer survivors and their caregivers. Studies of the effects of yoga on quality of life in people with cancer have shown encouraging results. Yoga has been shown to improve insomnia, decrease fatigue, and reduce stress as well as the side effects of cancer treatment. 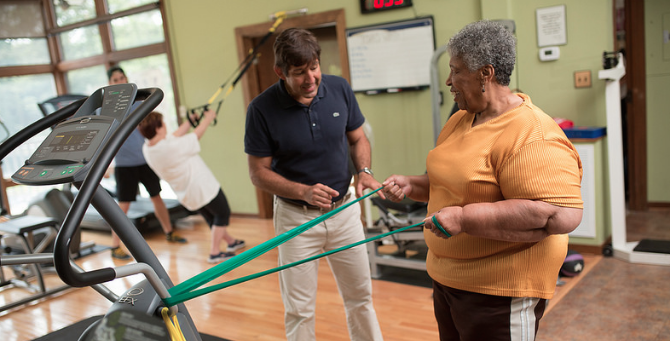 A 10-week exercise program for cancer survivors who have been treated within the last year. The program is limited to 6-12 participants. Classes will be held at the UNC Wellness Center at Meadowmont. Each exercise session will consist of a small group routine that varies each week. Progressive exercise will include, but is not limited to: Cardio Machines, Strength Training, Functional Training, Core Training, and Flexibility/Range of Motion Exercises (for example: Aqua Aerobics, Yoga, Low-impact Aerobics, and Mindfulness/Meditation Training). For more information, please contact the UNC Wellness Center at Meadowmont at 919-966-5500 or visit www.uncwellness.com. In the Triangle, LIVESTRONG at the YMCA meets year-round at YMCAs throughout Raleigh, Durham, Sanford and Chapel Hill. Class days and times are decided by the participants and vary from session to session or location. Contact your local YMCA for more information.